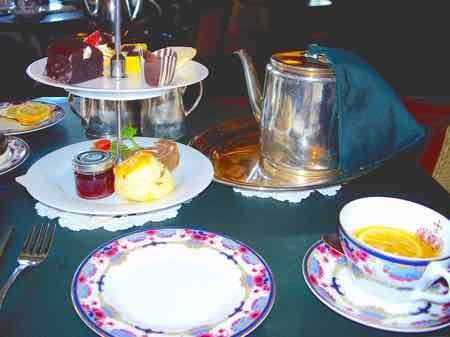 ...A proper afternoon high tea that is... really should be part of your visit to Victoria. 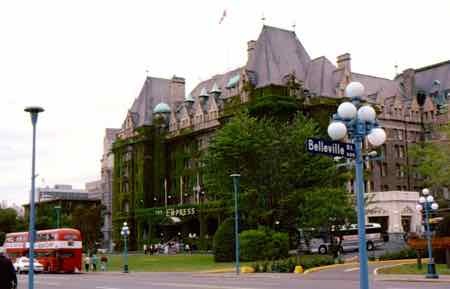 The magnificent old Empress Hotel opened in 1908. It was at the end of the line for the Canadian Pacific Steamship line. It soon developed a reputation as a stop for the rich and famous visiting Victoria. Today The Empress maintains the traditions started a century ago. The hotel sits at the head of the Inner Harbor of Victoria... and just like the Queen it is named after, it is much beloved. You can indulge in one of Victoria's grandest traditions even if you don't stay at the Empress. Just as we said... remember the Empire. You can take afternoon tea at the Empress Hotel. Just in case you've never really understood what afternoon tea is, let us tell you that it's more than just a "cuppa". The most basic of afternoon tea includes at least scones, jam, and cream. Scones are a flaky but dense pastry that are sort of like biscuits except they tend to be savory but also very slightly sweet and may have raisins in them. They really are yummy, and you need to try them. We're talking rich, clotted cream here.... rich and very spreadable on those scones. High afternoon tea at the Empress Hotel is much more than basic. There is fresh seasonal fruit with cream and "finger sandwiches" like smoked salmon pinwheels and cucumber sandwiches. There are pastries and sponge cakes... and of course scones and cream. They don't neglect the tea... no tea bags here! They have their very own Empress blend of tea... complete with descriptions that any wine lover would appreciate like "burgundy depth with light oaky notes" and "superb fruity and sprightly flavor". Take the kids... they have a "Prince and Princess" tea with sandwiches more to little one's tastes... like peanut butter and jelly sandwiches and bubblegum tea to go with those scones. We took our nieces when they were 8 and 10 and they thought it was funny, but fun. There is a dress code.... smart casual. No raggedy jeans, short shorts or flip flops. This is a proper tea after all. Check with their website to make sure you're dressed correctly. Reservations are required. You might be able to make them when you arrive in Victoria, but it would be better to make them one to two weeks in advance in high season. Don't let all this talk of "being proper" put you off. Put on your good clothes, collect your best manners, and go for afternoon tea at the Empress Hotel.